Good news, everyone! It’s official, I’ve gotten us prize support from Riot for the League of Legends tournament that myself and the folks at W9G will be hosting at Anime Milwaukee this year. Turns out Rito has changed the procedure a bit on me for receiving and doling out prizes so there were some extra hoops involved but I persevered and things are looking up. While we’re on the subject of the LOL tournament though I’d like to post some particulars regarding this new process and some stuff regarding schedule, format, and so on. 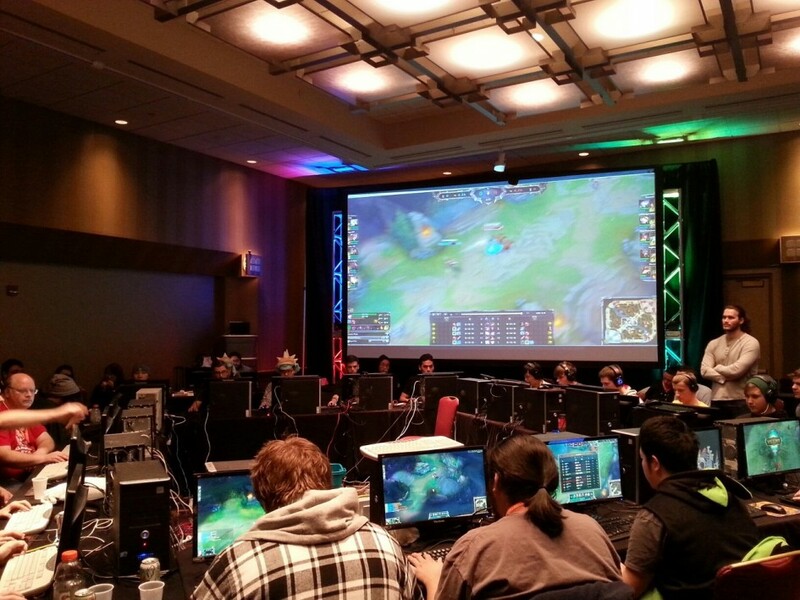 This is an In-Person 5v5 tournament. Both Premade Teams and PUGs or “Free Agents” are allowed to join. Whether PUG or Premade, signups close at 4 p.m. Friday, Mar. 11. Fee: None; this is a free tournament but you do need to have a badge for AMKE. Entrants: 16 Teams of Five – signing up online before the convention will increase your chances of having a spot in the tournament. Each team is allowed one alternate. Alternates only receive prizes if they actually play. Players may not sign-up with more than one team. Format: Four total rounds. The first two rounds are single elimination. The semi-finals and finals are a Best of 3. There will be no fourth place match due to time constraint. Fourth place will be determined by tie-breakers. The bracket will be randomly seeded. Hardware: World9Gaming will be providing the actual PCs/Gaming Machines for the event. You are more than welcome to bring your own keyboard and mouse. We also strongly encourage you to bring a headset or headphones. Tournament Schedule: The tournament begins at 6 p.m. Friday, Mar. 11. The finals match starts at 12 p.m. Sunday, Mar. 13. Match times will be approximated (usually within 45 minutes of each other) with team captains being informed of their upcoming match via social media (potentially text) prior to the previous match’s finish and allotted a 15 minute check-in period. Failure to check-in results in a forfeit. Day 1: Friday. Knock-out Round 1. 6 p.m. start. Day 2: Saturday: Knock-out Round 2 and Semi-Finals Bo3 (not likely to go past 10 p.m.). 12 p.m. start. Day 3: Sunday. Finals Bo3. 12 p.m. start. Additional Prizes: We’ll have an additional pool of VGR prizes of an Anime Nature. Assorted posters, keychains, and so on to hand out, out to 3rd-Place. Note About Prizes: New this year, to receive prizes from Riot, you MUST register your Summoner account for this event on the League of Legends Community Events page. Registering through the community events page DOES NOT register you for this event. Registration: Now clicking the link above and registering on the LOL Community Events page is all well and good (and you should totally do that at some point), but it is not a Sign Up sheet for the event itself and will not include you in the bracketing – it just qualifies you to receive your prizes from Riot. To actually register for the tournament and be properly seeded into a bracket, send an email to magicalmistermephisto@gmail.com with the Subject LOL Tournament Team (if you are registering a team) or LOL Tournament Free Agent (if you’re just registering yourself). Please provide your Team Name, the Summoner and First names of all participants along with their roles, and contact information for the Team Captain (twitter, email, etc). Since Anime Milwaukee is a live event there will be an in-person sign up sheet at the event. Registration for online and in-person sign ups closes at 4 p.m. on Friday, Mar. 11. For any additional questions or comments contact me through direct message on Twitter @mr_meph or send an email to magicalmistermephisto@gmail.com. Good luck, Summoners, I look forward to seeing you all at Anime Milwaukee this year.